While you’re exploring and digging around, how about we set up a military? You’re going to need one, goblins are pesky bastards and likely to bother you more and more (if they haven’t already). Soldiers can be a bit fiddly to manipulate, but once you get the hang of it you’ll find it second nature. The first thing you will need to do is draft some dwarves into your military. There are a few different strategies for this. First up, you can pick complete newbies and let them work up their skills and strength through sparing. Another strategy is to have some peasants work on screw pumps to quickly build up their strength and toughness before drafting them. Others like to use miners (which train up quickly and are thus easy to replace) as they usually are quite strong and tough already. As a further consideration, some don’t like to recruit women as soldiers. When they give birth it’s not uncommon to see them running into battle carrying a baby. This is both somewhat alarming and somewhat risky as you’re going to have potentially dead babies on your hands due to combat, something that might cause a lot of emo among your dwarves. Hit m for the military screen. Scroll left then down with the arrow keys, to one of your no-life peasant dwarves, hit Enter. You will see the peasant is marked and you can chose another dwarf. Chose another pleb, hit Enter. Chose another spare peasant, hit Enter to promote and then choosing two more dwarves, create squad two. 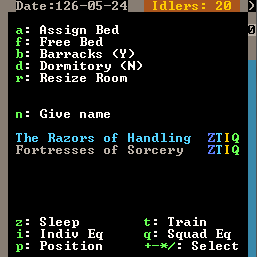 You will now note that the dwarves in the same squad are now sharing the same squad name, The Razonrs of Handling and Fortresses of Sorcery for me! Scroll to the first squad leader, hit a for activate. Scroll to the second squad leaders and a activate him as well. On the first squad leader, hit v for view squad. If the squad is on duty hit t to stand them down. Hit f for Food carried and they’ll go get backpacks and put a stock of food in them for long duties. With the military screen up, hit w for weapons. You now have a field you can move around using the arrow keys and cycle using Enter. Leave the dwarves unarmed. Scroll to the first A, which is for armor and hit Enter until the field shows Lth for leather. Then go to the next column and hit Enter until you see Shd for shield. Sparring unarmed trains the wrestling skill, and builds the key stats (like all training) but also trains quickly. Hammer weapon skill is the skill used by crossbow dwarves when out of bolts. Yes, they bash the enemy to death with their crossbows. We can train hammering latter. Wrestling helps when an enemy disarms your dwarves as they have to fight unarmed then, and yes, a few enemies can disarm your lads. Finally, picture newby dwarves with no skill training with razor sharp steel battleaxes. Yes, picture a few graves. Wrestling gets them tough enough to spar with decent weapons without a lot of weapon access micromanagement in the stocks screen (ie. forcing them to pick up wooden weapons and later on dropping them in favour of proper weapons). Using the m military a alerts system, start training! Specifically: we want them training in small groups, in every month. This is the fastest way to build martial skill, since they don’t all stop if one lazy midget wants a drink. One thing you might want to think about is providing food and drink and somewhere to eat close to your military dwarves. That way they will hopefully spend more time training and less time walking! …hmm, actually, I have so many bloody dwarves I’m going to put each squad up to four members each. That means we’ll have up to 8 dwarves sparing at once, good stuff. 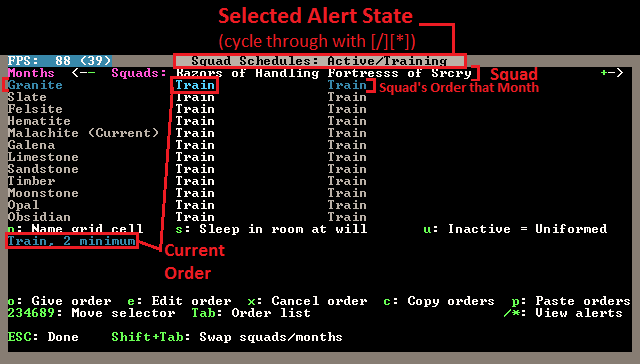 To add more dwarves, go to the military screen again, hit enter on the leader and then chose a dwarf to add to the squad. Note: It’s possible to end up with really convoluted command structures by accidentally making the boss of one squad the boss of another squad. This is annoying and pointless, as far as I can tell. To fix it, chose the problematic squad or person, hit enter on them, and then hit enter again. Hopefully that will remove them back up the chain of command. Or, hit enter on the boss and then enter on the dwarves 2 steps down, that will pull them back up to being directly under the boss’s command. A nice addition to your military are some war dogs. How do you get war dogs? Easy! Find a space in your workshop and b build a k kennel. This is a large building, so you may have to free up some space to place it. Then ensure you have someone with the animal training labour on (so it gets built and so you will be training animals). Then, go to the kennels using q and hit a for add task and then w for Train War Dog. Hit r to set the task on repeat. Hopefully all the adult dogs will now go about being trained. You’ll soon start getting messages like An animal has become a stray war dog. Good! Hit m to bring up your military. Hit c to look at a soldier. Hit e for Work Dogs. Hit r to assign a dog to that dwarf. Once you have enough trained, assigned one each. You can also train hunting dogs at a kennels and they are quite handy for hunters, since they too have the ambush skill that Hunters use. I don’t usually bother with hunter dwarves so wardogs is all I want! So your boys are training, putting each other in arm bars and whatnot. If you use v and look around your soldiers, hitting g for General, you should see their skills climbing. Use = to see the full range. Let them keep this up until they become champions or heroes. At this point they will no longer accept work dogs and become impossible to assign other jobs. The good news though, is that champions will actually use artifact items! Yay! So, let them train and while that goes on, keep digging as per the last chapter. Grid up all the digable space on the various levels and find gems, ore and whatever else is around! Ok, lets assume your boys have trained up to pretty damn good wrestlers, getting very tough and agile in the process. What’s the next step? Well, we’d like them to use chainmail, right? We could set them right into plate, but plate slows them down if they aren’t very good armor users (they won’t be yet). Chain will be just fine. Hopefully you’ve build a good pile of iron chainmail, helms, shields, grieves and whatever else you can see on the list. Now it’s time to assign. At the same time you’ve set a lot of iron warhammers to be built, right? Good! Go to your stocks menu under z. You should now see all your stocks updated by your bookkeeper, handy! Find the weapons first. Scroll through and look for any other hammers. Chances are iron hammers are all you have. For good measure, set everything that looks useless (ie, not an axe or a pick) to m for melt. Or put that trash into weapon traps. Go to the armor list (and subsequent clothing lists) and look for chainmail. Any chain item that isn’t iron chainmail set to forbid using f. Now your boys won’t go picking up the rubbish when you change their armor setting. Make sure you’ve got enough suits of chainmail armor, shields, helms, etc, to equip your lads. Or near enough. Now, you can go to the m military menu and hit w for the weapons and change them from Lth to Chn and the weapon to Ham. Your dwarves will rush off, grab a warhammer and throw some chainmail on top of their leather armor, great! If a few of them get to be awesome armor users you can change them to plate and they will even put the plate on top of their chain on top of their leather. A tiny, cute, drunk, ball of fury! Go to a squad leader, hit v (not a, that turns them back to peasants – but a again will turn them back to squadies). Hit t to make the squad respond to orders. hit z to zoom to the commander. Hit s to station the soldiers there, or hit p to place a patrol point and then move your cursor around and hit p again to place another point (and keep hitting p to place more). There’s a lot of ways of handling military, and we haven’t even covered crossbow weilding marksdwarves, multiple weapons, archery targets, or any of that stuff. For now, go and build your military and come back for the next and final chapter where we’ll round out your lesson with some final touches! 8.3. Get tough, little guys!